Organisations usually come to us when they are facing a new challenge or are entering a new phase. We offer help for one-off initiatives as well as long-term and more in-depth collaborations. In addition, we are often involved in thinking about how analyses and changes will be communicated. The figure below encapsulates what we do. 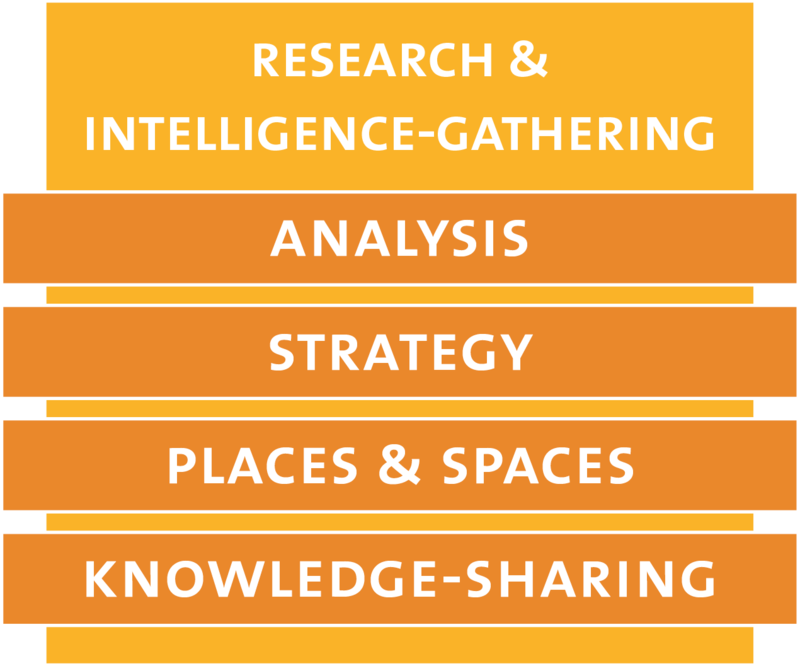 We do our own research and intelligence-gathering as well as provide a unique overview of existing research. This work lays the foundation for everything else we do. We offer strategic consulting and organisational development linked to change management and business growth. We can provide help for both one-off initiatives and long-term, more in-depth collaborations. Many of our projects have a strong connection to a specific location, everything from developing creative districts and meeting places, to entire site and destination development. We also perform impact assessments of concerts, festivals and other events.